Facing iTunes Error 29 & looking for fix? iPhone users often encounter a iTunes error 29 – whenever some hardware component on the phone’s mainboard is changed, or maybe even the battery. The slight change of electron flow pattern triggers the error message within Apple’s system and it offers bothers the users to an extreme extent. However, the error is similar with the iTunes error 50 and it’s generally shown during the restoring or updating the iPhone. In few cases, the error might appear even if nothing on the main board has been changed as a result of some software bug. Apple hasn’t issued any direct fix to this issue; but few do-it-yourself fixes can help iPhone users get rid of the annoyance. Problem with the Battery – Did you changed the iPhone battery recently? If you have changed the battery of your device, this can be the problem because you got error 29 in iTunes. To fix the error 29, you need to replace your battery with the original one, and start the restore / update process again via iTunes. Problem with the Antivirus – If the iTunes Error 29 shows up due to a software bug, then it could be for the antivirus software installed on an iPhone. If the error-showing smartphone has an antivirus software, then the users should prompt the following – update the antivirus first from the iTunes App Store, restart the device and check whether the error has been fixed. If it’s not, then complete removal of the antivirus program might work. This is the most popular and accurately working fix for the Error 29 trouble. Problem with iTunes – Software update or factory reset using iTunes requires the iTunes software installed on a computer to be updated to the latest version as well. A backdated iTunes may fail to recognize the newer hardware characteristics and produce a false error 29 message. Upgrade iTunes and restart the computer before attempting to update the phone. Old School Technique – Restart! – Sometimes, the old school technique of restarting both the computer and your iPhone really helps solving troubles like error 29. Power down the iPhone completely and also restart the computer. After the computer turns on, turn on iTunes. Turn on the iPhone again and start connecting the iPhone to your computer to see whether it works or not. Update Computer Programs – Older OS or other older versions of other problems could arise a conflict between platforms and as a result, miscommunication might happen between iTunes and iPhone interface causing error 29. To avoid this trouble, keep your computer up to date. Maybe install a latest service pack, or update to the latest version of Windows or Mac OS X – whichever applies to your setup. Restore Without Sim Card – Remove the sim card from your device, then restart the device (you can hard restart it), now connect to iTunes and start the restore process. Factory Reset iPhone – If all of the above solution fails, erasing all the contents and settings stored on an iPhone could do the magic. It’s not a full-proof solution and even after a factory reset the problem could prevail – but the attempt to solve the problem this way is worth a shot. Since factory reset deletes everything from an iPhone and makes it fresh like new again, it’s wise to back up everything. Then Settings > General > Reset and approve. In Case of a Hardware Problem – If none of these methods do not work for you, then it may be a hardware issue. Drop your iPhone to an Apple authorized customer care. If the phone is still under warranty, file a claim request. iPhone Error 29 is usually easy to solve – unless there’s something really wrong deep down. 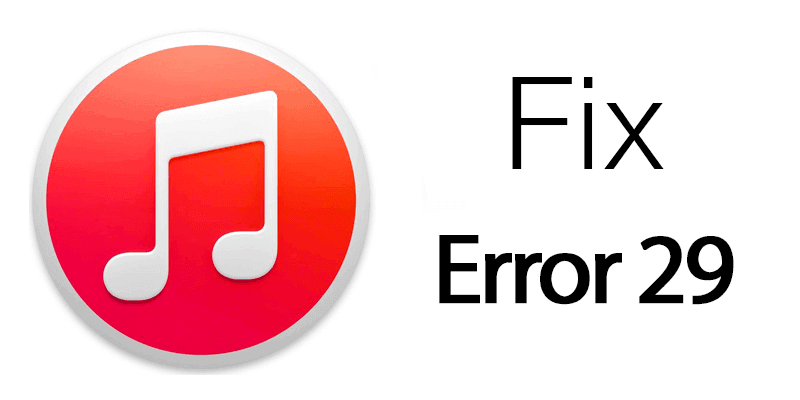 Did you fixed the iTunes error 29 – tell us in the comments section below.